Okay, we can rule out a single cell failure. Your battery has lost a lot of capacity due to deterioration. DCFC doesn't seem to be an issue. So it's likely heat, or charging to 100% SOC, or both. If the car now has a 70 mile range and has to do a 50 mile commute, I can understand the need to charge to 100% SOC. But once you get a new battery and the car has a 100 mile range, I would stick to 80% charging. The most likely damage to the battery comes when the battery is above 45C and has no chance to cool down. This may happen if the car is driven fast for 25 miles, and then parked in the hot sun for 8 hours. It is the power needed for driving that causes the battery to overheat. The problem is the cooling fan does not work when the car is off. Once parked If the battery got too hot, it will stay too hot. 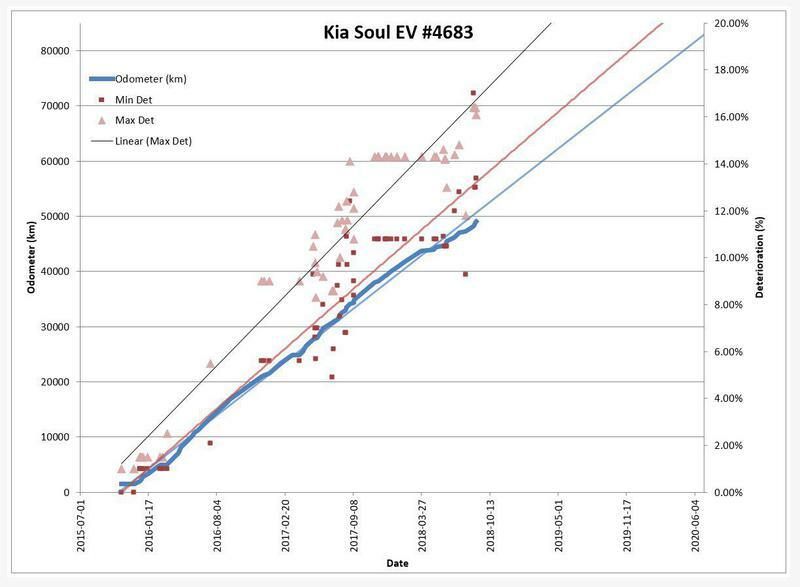 This is a big difference between a Soul EV and a T esla. 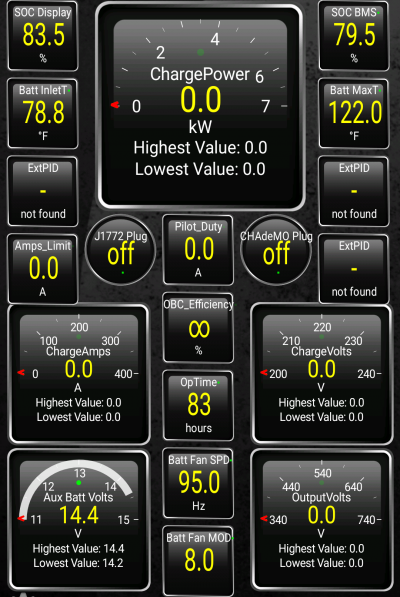 The next data to check with Torque is battery temps. How hot is your battery at the start of the day, How hot after a 25 mile drive. How hot after being left parked in the sun for 8 hours. On my car the battery temps stay around 30C day and night for the entire summer. I only drive about 40km a day, at about 50km/h. I always L2 charge to 80%. I always try to park in the shade. This temperature 30C does not seem to damage the battery. Just took a test drive logging data, but saw that only GPS data is being logged. I figured out how to add additional data points for logging, and will do another test run to verify. Added battery temps to the logged data. Anything else you want let me know. I'll do a 25 mile test drive just to see what the battery temps do. It is fairly cool here this morning, so we are not going to get much valuable data. I'll post later about the use case that I believe may be causing the degradation. Your post right above is right on track. Ok, data logging is working, and I can capture any/all of the required data points at 1Hz rate. I just took a test drive of about 20 miles. 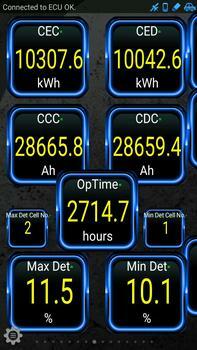 Battery temp started at 25C and went up to 27C over a 26 minute drive. My SOH remained at 79.1% for the entire drive as expected. The use case Jeju mentioned is this one: "The most likely damage to the battery comes when the battery is above 45C and has no chance to cool down. This may happen if the car is driven fast for 25 miles, and then parked in the hot sun for 8 hours. It is the power needed for driving that causes the battery to overheat. The problem is the cooling fan does not work when the car is off. Once parked If the battery got too hot, it will stay too hot." This is exactly the use case! My wife commutes 25 miles in the morning, then the car sits in the sun for 8-9 hours. On the way home she is often going 75 mph. Not clear if I am going to be able to capture a log of this, since the Torque Pro is installed on my cell phone and not hers. I will be able to check the stats periodically though and monitor her degradation on her commute versus my degradation on my commute. If she degrades it but I don't then that isolates it. Note that I park at work in a parking garage at all times, and drive slower too, much shorter commute. Big picture question: If Kia is aware of this use case causing battery degradation, have they changed the functioning of the system to alleviate this in the future? For example, does a new battery provided following a replacement still not do this: The problem is the cooling fan does not work when the car is off? I would think that if Kia were aware of this specific degradation issue, they would alert owners to the issue. You can see the battery temp on the top right corner. Make sure the car is on before you use Torque. And the reason for never allowing your battery to get to 122F (50C) very often. Have been collecting some reports from Quebec about battery degradation. will post shortly. But first. The city with the fastest degradation on EVs without a liquid cooled TMS is Phoenix, Arizona. The reason is heat. Daytime summer temps in Phoenix, Arizona can go above 45C. Here's one more statistic from Phoenix, Arizona. 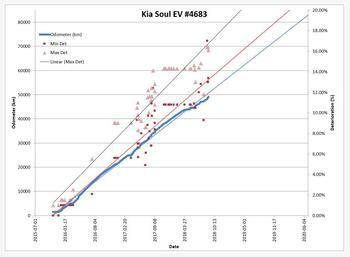 2016 Soul EV, 21,568 miles, GOM at 100% showed 40 miles. 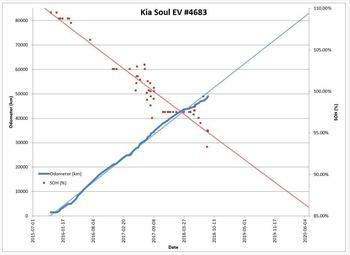 I am going to compare the battery deterioration of Soul EVs in Quebec against the cars on Jeju Island. It seems like cars in Quebec are suffering more deterioration. As of August 1st 2018 there are 1,912 Soul Evs registered on Jeju Island. As of June 30th 2018 there are 1,149 Soul Evs registered in Quebec. Jeju Island has a much warmer climate than Quebec particularly in winter. Jeju Island does not get extreme heat or cold. My car is 40 months old has driven 50,248km and is now at 99.2% SOH. A friend's car here has roughly the same stats. My car was checked at Kia yesterday. The Torque data shows the exact same 99.2% as the official KDS. The formula we use in Torque is 110 - (Max + Min) /2. If my car represents an average car on Jeju then these cars will reach 70% deterioration after about 12 years and 180,000km. 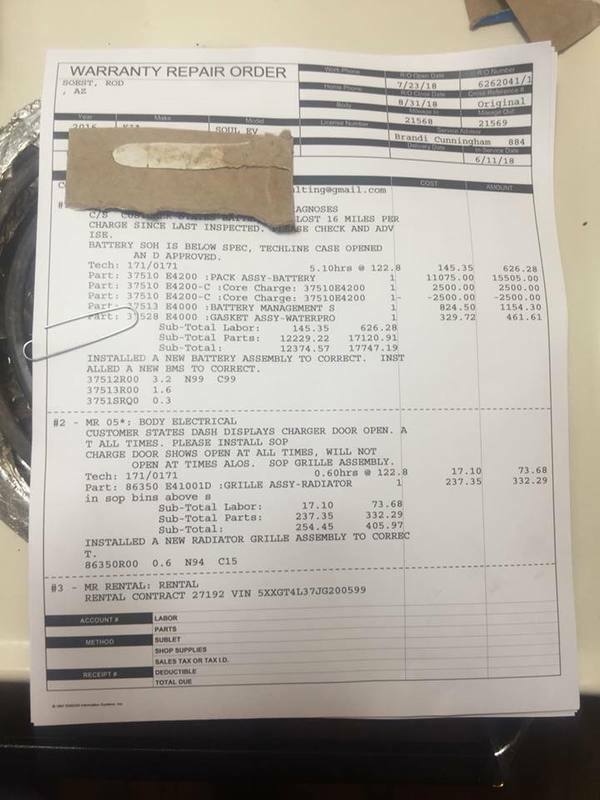 I will not get a free battery replacement under warranty. I chatted to the Kia tech at my local garage about deterioration. He guesses most cars here will need a battery replacement between 150,000km and 200,000km. 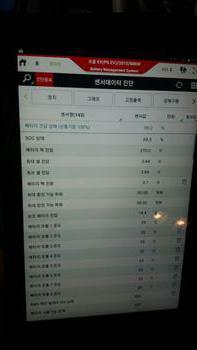 He has had 1 car that came in with 150,000km and 68% SOH. Currently my garage does not have the equipment to do the replacements. They will buy it next year. As reported earlier there was another car on the island that got a battery replacement. There seem to be many users reporting range loss and lower battery health. Jonathan's Soul EV is a MY2015 with 75 000 km, owns it since December 2014. 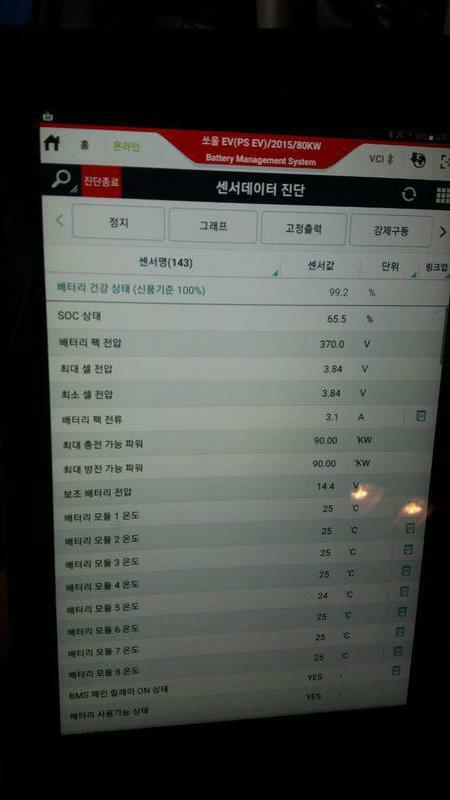 Mostly charges on L2, rarely on L3. On summer, consumption is aroung 14-16 kWh/100km. Range was 150-160km (summer 2015 and 2016), 130-140km (summer 2017), 120-130km (Spring 2018) and 100-110km (summer 2018). Official SOH reading at 91% this spring. Official reading on Aug 26 = 71.6%. Dealer says he has to wait until it drops below 70% to do something. He was wondering if it's normal degradation or not. As I said in the comment in the tread, this is the kind of numbers that I am experiencing (however I'm currently around 130km on the highway — well, before vacations. I'll go to my parents tomorrow I'll let you know). GOM was at 189 I think when I received the car, and driving in the city and highway (100 km/h) we could get around 170 km at the beginning, in the summer. More like 145 km in 2016, 140 km in 2017, 130 km this year. At the beginning, Nathanaël wonders why even in the first summer he couldn't get further, extrapolating theoretical driving range using 27 kWh as a base. Natanaël's Soul EV GOM was at 212 km at the beginning and could travel easily 190 km (note: I think it was probably in the city mostly). Summer consumption is around 11-13 kWh/100km. Miriam's Soul EV has the same situation as Jonathan. She was waiting to drop below 70% as well. Nicolas's Soul EV (he has the lowest VIN number I've seen, lives near me) is at 93.4%. He could do easily 160 km in 2016, now he can drive 125 km if he's careful. Claude asked how Jonathan charged the car. Jonathan charges mostly on L2 as previously said. Before he was charging aroung 80% and 100%. Now he charges at 100%. Claude seems to imply that charging at 100% may accelere degradation. François Morin also has similar numbers, MY2016 (a bit newer than mine), 70 000km. He says since the last BMS update, the last 15 km is more predictable (decreases more linearly than before). Phil Duf (lives near me too), MY15 137 000 km SOH 64%, 80-90km range. His daily commute is 83 km. Under investigation during all summer, now turtle mode starts at 35 % SOC. Kia Canada is aware. Jonathan asks what's the price of the Soul EV battery, no one really knows. Only reference I found is on KiaPartsNow website, and may not reflect the real price. Guillaume Godbout got his battery changed, was below SOH 60%. One year later with the new battery SOH is still at 100%. He now avoids DCQC like hell, just in case. Philippe Tremblay wonders if it's a good thing that Soul EV charges so fast (read: unlike L eaf) no matter what, and if this could degrade the battery under some conditions. Yvon's Soul EV can do about 130 km as well (MY16 titanium like us, a few months younger). Did a lot of QC, ~250. Francois Boucher says that some battery degrade even if they dont do QC (like base models), so QC may not be the cause. He is a regular user on the Quebec Forum and he thinks his car is average for his area. 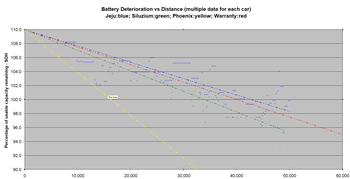 Here's a comparison of the data from my car and Siluzium's in Quebec. Note the trend line in yellow is for the Phoenix cars. These cars die early in the extreme heat of the Arizona desert. The big question is why? Why is Quebec doing worse than Jeju, when cold weather is supposedly good for battery longevity. It would be great to have more data from Norway. That is the place with the most Soul EVs. But there is very little data. Here's a graph showing how the 20 cars I'm monitoring are behaving. These cars are driving about 50,000km in the first 3 or 4 years and losing about 10% of the battery health. That equates to the buffer. 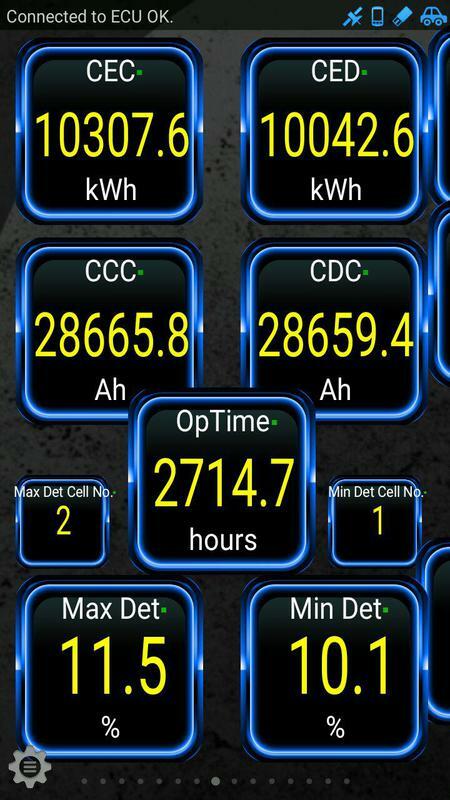 Hence after 3 or 4 years usable capacity remains close to 100% SOH. We already have a climate zone outlier. Phoenix, Arizona. All 14 cars there have failed. Reason = extreme heat. It seems we have a second climate zone outlier. Quebec. Possible reason = extreme cold. 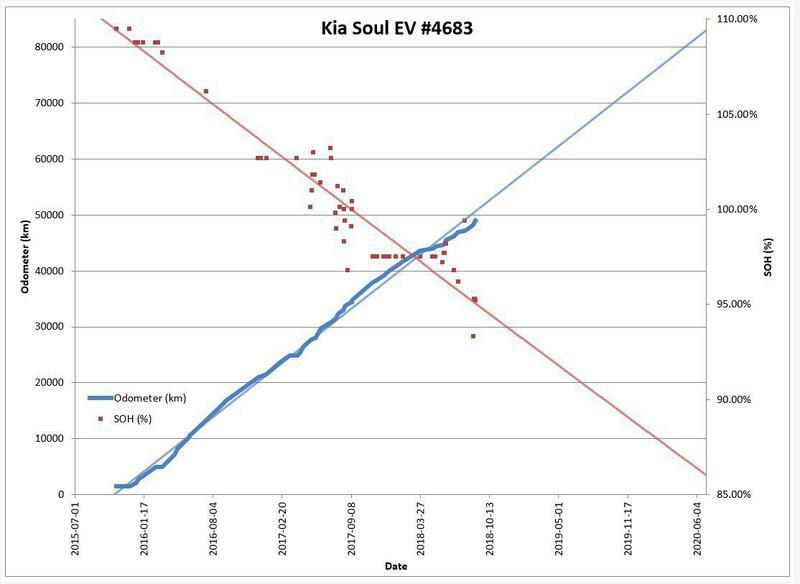 This summer and fall there was a campaign on the 30kWh Soul here in Sweden, where Kia offered a 60,000 SEK (¨€6,000) rebate on top of the 60,000 SEK state incentive. In Juli I asked my dealer for a trade in and got a deal I couldn't reject. Took a long time, but this week I finally picked up my 2019 Soul EV. One note about the 4 dips on the Min% graph: They all occurred when the charge was interrupted just around the SOC when the deterioration values were to be updated. So if you have similar outliers in the lower values, they are not to be trusted. Thanks for all the data Elmil. Good luck with your new car. Your old one is the best we have data for!